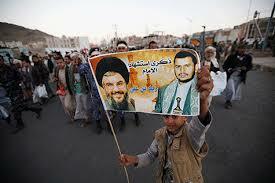 A boy holding a poster of Lebanon’s Hezbollah leader and the leader of the Shi’ite Houthi movement during a rally in Sana’a, Yemen, on October 26, 2016. Yemen’s Foreign Minister, Khaled Al-Yamani sent a letter of protest to his Lebanese counterpart, Gibran Bassil, over Hezbollah’s increasing support for the Iranian-backed Houthi rebels..
“We in the Republic of Yemen reserve the right to present the matter to the Arab League, the organization of Islamic Conference and the United Nations Security Council,” Al-Yamani said. The minister expressed his dismay at remarks made by the group’s Secretary-General, Hassan Nasrallah, in which he called to fight the legitimate forces, considering them blatant interference in Yemen’s internal affairs. “Hezbollah’s support for the Houthi militia coup is evident in the televised speech of Nasrallah, on June 29, during which he incited to fight Yemeni government forces,” Al- Yamani said, adding that Nasrallah said in his speech that he and his fighters wish to join the battle in Yemen alongside the Houthis against the internationally recognised government of President Abd Rabbuh Mansur Hadi. This, Al-Yamani said, “endangers Yemen’s national security and fuels a war that would destabilise security and stability in the region”. Urging the Lebanese government to “rein in” Hezbollah “in line with the dissociation policy,” Yamani accused the Iran-backed party of “taking part in training, plotting and incitement” in support of the Houthi rebels. In his speech, Nasrallah had denied that any of Hezbollah’s fighters were killed in Yemen after recent claims by the Saudi-led coalition that it killed eight of its members there. The Saudi-led coalition has repeatedly accused Hezbollah and its backer Iran of providing help to Houthi rebels, including ballistic missiles from Tehran that have targeted Saudi Arabia. Because the fvcking Iranians are trying to spread their shiite revolution all over and destabilize any country it infects with its own vile version of Islam. It is already too late for Lebanon, they are already heading for another summertime war with Israel and apparently will now be fighting with Hezbollah when Iran starts that war..